Everything looks better when the ball goes in the basket. That’s one of Roy Williams’ favorite sayings any time his UNC squad has a particularly good game. 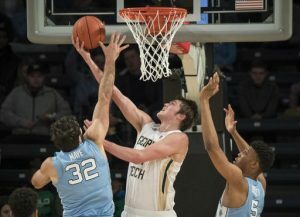 Saturday afternoon in Atlanta, the head coach discovered what the opposite of that looks like–as his ninth-ranked Tar Heels struggled to show many positives during their shocking 75-63 upset at the hands of the Georgia Tech Yellow Jackets. On many occasions, statistics aren’t always the best indicator of how a game played out. A bounce here or a bounce there is the difference in the final score more often than not. Then there’s UNC on Saturday. The Tar Heels (12-3, 0-1 ACC) turned the ball over 20 times, made just 33 percent of their shots and connected on just five of 26 three-point attempts on the way to a loss in their ACC opener. Numbers like that are a recipe for disaster against any opponent—a statement proven quite literally by the fact that respected analyst Ken Pomeroy ranks Georgia Tech (9-4, 1-0 ACC) as the 156th best team in America. During his 14-year tenure at UNC, Williams has never lost to a school ranked lower. UNC struggled to stop dribble penetration all game long, which led to many easy opportunities for the Yellow Jackets around the rim. Guard Josh Okogie scored 26 points for new Georgia Tech head coach Josh Pastner, including an 11-for-13 performance from the free-throw line. By creating lanes to the basket on nearly every possession, the Yellow Jackets were also able to get the Tar Heels into foul trouble. Joel Berry, Isaiah Hicks and Nate Britt each ended the game with four fouls—while Georgia Tech shot 33 free throws in total. Despite trailing for much of the day, the Tar Heels were able to take the lead midway through the second half thanks to a 9-2 run from Britt and Luke Maye off the bench. Unfortunately, UNC could never get comfortable against Georgia Tech’s funky 1-3-1 zone defense. 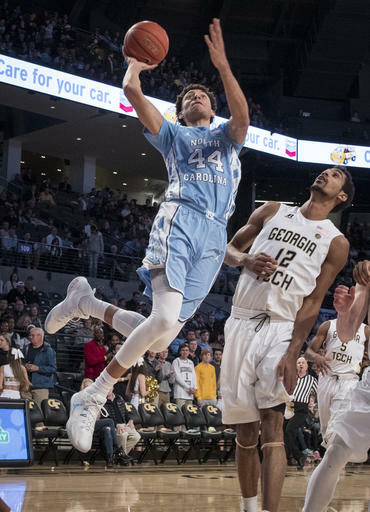 The Yellow Jackets constantly collapsed on the Tar Heel post players—who combined for just 16 points—while practically daring UNC to shoot from outside. Justin Jackson ended up leading the Tar Heels with 16 points on 17 shot attempts, while Britt’s 13 points represented the only other player to reach double figures for the team. Berry was still dealing with the after effects of an illness he had earlier in the week, and was only able to contribute eight points and one assist—while turning the ball over six times. “We didn’t move like we wanted to move and we didn’t get to spots we wanted to get to,” Williams said. “We practiced against it yesterday in preparation, but the coach didn’t put us in the right spots and didn’t get us to make the right passes and didn’t get us to come and meet the ball like you’re supposed to come and meet it. Coming into the year, it was well known that the ACC was expected to be the toughest league in the country. Still, though, the rebuilding Yellow Jackets were selected to finish 14th in the 15-team conference. Pastner—the young, fresh-faced coach—and his team have sent quite a message with this shocking upset. Rankings and predictions don’t mean anything once the game starts. “I just think it speaks to the weakness of North Carolina right now,” Williams said, bluntly. “I don’t every try to figure out what my record’s gonna be or what anyone else’s record is gonna be. UNC will have a two-day layoff before returning to action on Tuesday against Clemson. That game will be played at Littlejohn Coliseum and is scheduled to begin at 7 p.m. The Tar Heels outrebounded Georgia Tech 44-37. UNC was outscored in the paint–an area it usually dominates–by a margin of 30-28.